Albinus on Anatomy This is my favorite book to use for teaching. The illustrations are beautiful. The Anatomy of Movement, by Blandine Calais-Germain. It is frequently sold with The Anatomy of Movement: Exercises book by the same author. This is a great resource for both gazing at bones, and learning about the functional anatomy of movement. If you’re looking for more hands-on learning, try the Anatomy Coloring Book, by Wynn Kapit & Lawrence M. Elson. I think this is how I learned my anatomy. Also, research shows that coloring help you relax and focus! 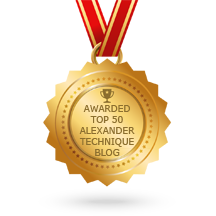 How to Learn the Alexander Technique, a Manual for Students, by Barbara Conable is an excellent resource for dispelling myths about your body (for example, your ankle joints aren’t big round circles), and helping improve your movement patterns through educations about actual joint anatomy. The pictures aren’t too great though, so I would recommend getting this with another anatomy book. If you want to go deeper and learn about fascial lines, nothing beats Thomas Myers’ Anatomy Trains.